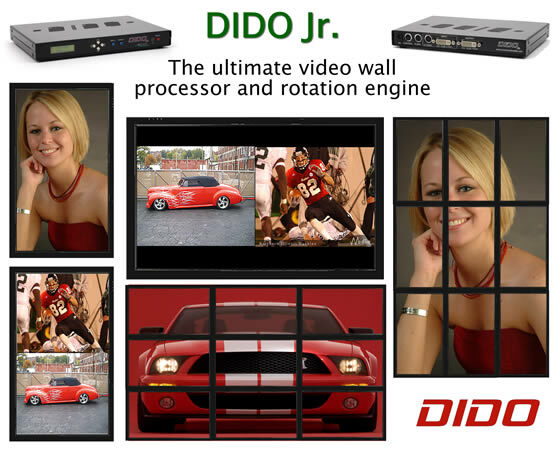 DIDO Jr - The ultimate video wall processor and rotation engine - Aurora Multimedia Corp.
On-screen display menus make the DIDO Jr. a breeze to set up. Input and output resolutions are completely customizable to match the displays optimal resolutions. User presets allow for simple manipulation of the video wall. You can easily set it up to go from a single large image shown across all monitors to unique images on several groups of monitor. Check out our other DIDO variations like the Pro (quad window on single display) and LT (non-rotation videowall processor). Several modes of operation including: Side-by-Side (split screen) images, Image Rotation (for digital signage), Translucent Overlays to maximize main image size while still seeing PiP.